No, jsem zvědavý. Bude to takto asi spíš EVEko. Lokální klany, regionální aliance. A útok někam do prdele na druhé straně bude muset být hodně, hodně dobře naplánovaný a otázka, jestli to bude mít význam. Zerg pořád bude mít výhodu, to je jasné a je to tak všude. Ale nebude asi schopný uhlídat všechny hranice proti všem enemies, co tam budou. To bude logistický oříšek. 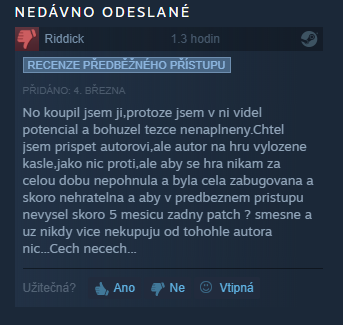 Vypadá to takto fajn. Co si pamatuju, tak tehdy Nenisis nebo jak se jmenovala s tím týpkem leavnuli hru právě kvůli neexistující diferenciaci a tady to vypadá fajn. Ještě mohli kurva práce spojit ty dva projekty DF dohromady a udělat z toho to nejlepší a podělit si zisk. To by pak bylo hodně good. - We now have a quest tracker, which should help new and veteran players navigate the game's content. - When interacting with an NPC, it will open the quest tab immediately. - We reworked the tutorial to be a lot less verbose, in favor of contextual help buttons. Players will get faster into the action. - Slightly changed default bindings. More work needed. - The title window opens when a new character switches to interface mode for the first time. - Monsters can no longer become enraged. - Crafting recipes and xp gains have been reviewed. - Reduced the cost to craft lower tier armors. - There are no market places fees on weapons, staffs, armors and bows of rank 20 and bellow. - When a player spawns, dismounts or detach the leash of a mount, he becomes the temporary owner for 2 minutes. - Only the temporary owner of the mount can mount or despawn the mount. - A player can only have one temporarily owned mount at a time, the previous ownership is lost when a new one is acquired. - Hitting a mount owned by someone else now properly calculates alignment/rogue statuses. - No longer prevents spawning or riding a mount. - Does not allow to use the mount's attacks (no knockback). - Allows to enter the newbie dungeon. - Funhulks have been removed from the game. - Wildlife no longer spawn in NPC cities. - Removed enchanted gear from all monster loot tables. - Fixed deepblades still dropping. - Removed gear from chests/treasure maps. - Added new rare resources to chests/treasure maps. - Checked that weapon racks/armor racks/treasure chests were fine. - Removed race changes item. - Removed armors from vendors. - Removed food and potions from vendors. - Added reagent, arrows and r0 of each kind to clan general stores. - Left r10 to purchase from some clan vendors. - change reagents cost to 6g each. - change arrows cost to 6g each. - Increase reagent drops from monsters. - Nerfed hourly hunt quests. - Allowed Silverley troll hunt quest to be picked by all races. - Lowered armors in quest rewards to r0-r10. - Removed thick leather from fire giants. - Removed elemental hoarfrost from windgraives. - Removed Nifl frost from what skins for snow hide. - Normalized leenspar golem drops to other golems level. - Buffed Selentine golem drops. - Thick leather odds now progress with monster tiers. - Added cloth to spiders and ghosts throughout the world. - Reduced leenspar key drops. - Runestones can no longer be bound and can no longer be used to teleport. - Removed sithra's active abilities. - Removed double spawns for server stability. - DXp is no longer gained when doing 0 damage to a monster. - Access to the global gold account is now restricted to Major and up. - Added a confirmation prompt when clicking the "Abandon holding" button. - When explicitly abandoning a holding, the local personal/clan banks are not transfered to retrieval vaults . - Retrieval vaults can only be retrieved in one go, not item by item. - Logging, woodcutting, smelting and Mining are now combined in a single title: Laborer. - Fixed armor master now works properly with arrow protection. - Skinning title now reduces skinning by 2s and increases probabilities by 20%. - Updated harvesting tooltips to the tool-free system. - The backpack can now be reduced to the same size as before. - Should now be able to use power hour and revive with tools. - Splitting a stack onto a bag should now properly transfer it. - Selecting items in an inventory should now displayed the selected weight. - The weight text field of inventories is colored according to weight and blinks when maximum weight is reached.